Ready for your Lady and the Tramp moment on the most romantic night of the year? 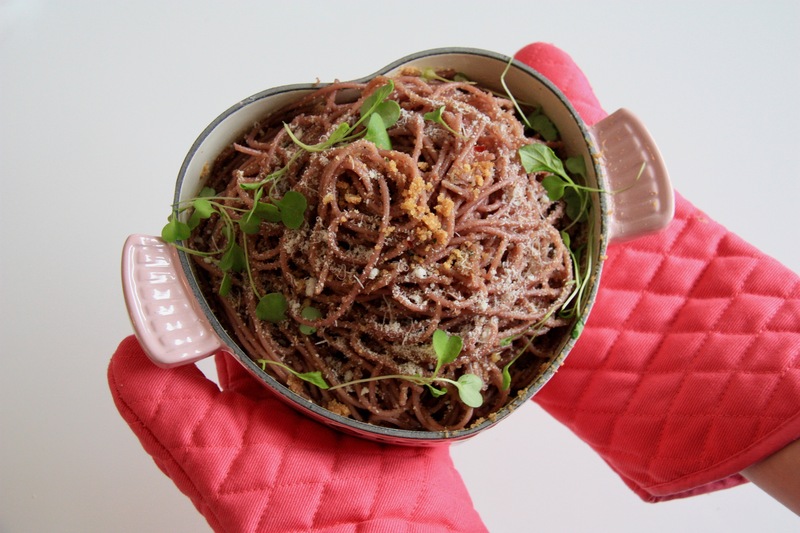 Try this recipe for Red Wine Spaghetti. The chilli flakes and spicy arugula will turn up the heat this Valentine’s day. The pasta itself is purely Canadian, because it made with 100% Canadian Wheat and produced by a Canadian company. It is also so simple to make, you wont have much clean up to do after dinner, leaving time for you know what… Skip the crowds at the restaurants this time, and surprise your special someone with a romantic homemade dinner. They will love it! To make this at home, you can order the ingrdients directly through the Italpasta Cart Starter in Grocery Gateway by Longo’s. Scroll down for the link. Cook pasta in a large pot of boiling salted water for 4 minutes. Drain pasta and return to the pot. Place the pot back on the stove over medium-high heat. Add the wine and sugar and bring to a boil. Cook for 6 minutes, stirring frequently to prevent sticking. While pasta cooks, heat oil in a non-stick skillet over medium-low heat. Add the garlic and chili flakes and cook for 30 seconds or until fragrant. Add the breadcrumbs and continue to cook until toasted, about 5 minutes. Season breadcrumbs with salt and pepper. Increase skillet temperature to medium-high heat. Add the spaghetti and any remaining liquid, toss for 1 minute. Remove from heat and serve garnished with Parmesan cheese and the microgreens.